I remember my first underground visit. I wont lie, I was pretty nervous, my mates that work underground had told me stories of tough guys freaking out as soon as they got to pit bottom and demanding they get taken back to the surface. So first time underground my heart was racing, I was super prepared, I had all the right gear, new shirt and pants also so I stood out like a sore thumb initially but they didn’t stay clean for long, coal gets everywhere…. In a recent Health indices report undertaken by the Mine Safety Advisory Council, only 47% of mines surveyed have a program to identify risks in MSD, with 23% of respondents self-identifying their approach to MSD as reactive. 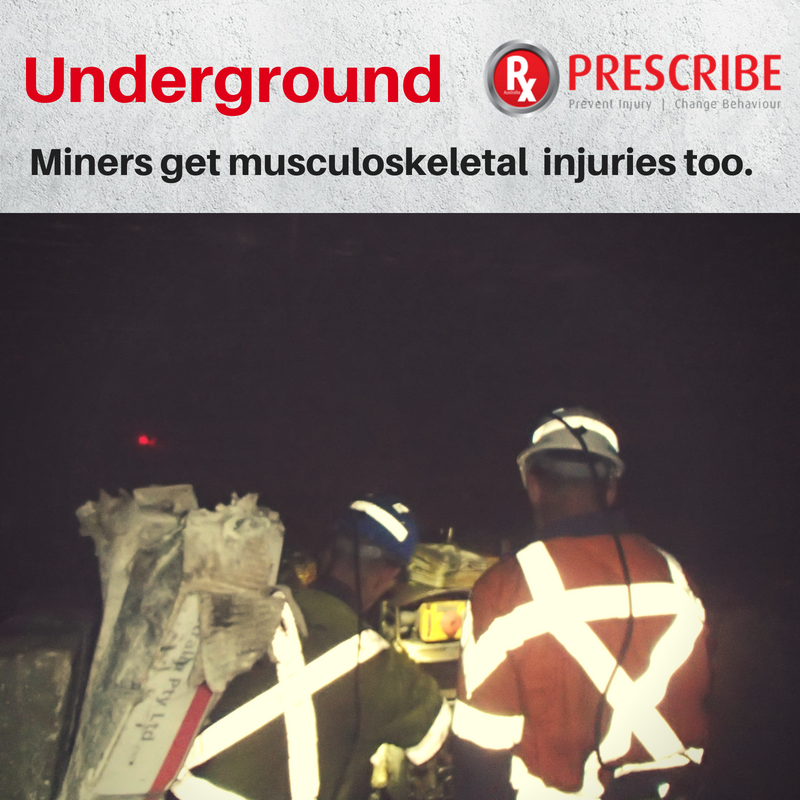 This is similar to that I have seen in some mining companies, not all of them, but the challenging environment can easily leave regular musculoskeletal injuries labelled ‘as a part of the job’ with no changes implemented. 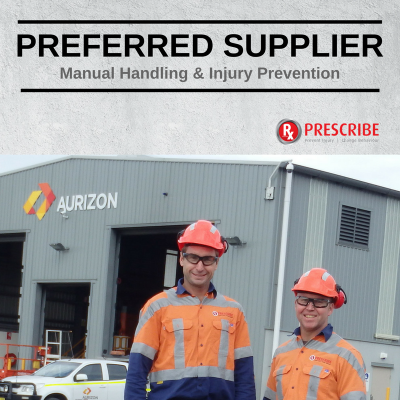 At Prescribe we strongly believe that MSDs are preventable and it is our vision to create workplaces that proactively prevent injuries. MSDs need to be managed as an essential part of your organisation’s WHS management strategy and system. 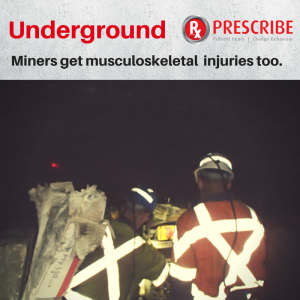 Musculoskeletal disorders in the mining sector are a significant drain on resources including workers’ compensation, sick pay, lost productivity, retraining and legal expenses. However, MSDs do represent an opportunity for savings because they are manageable and preventable. 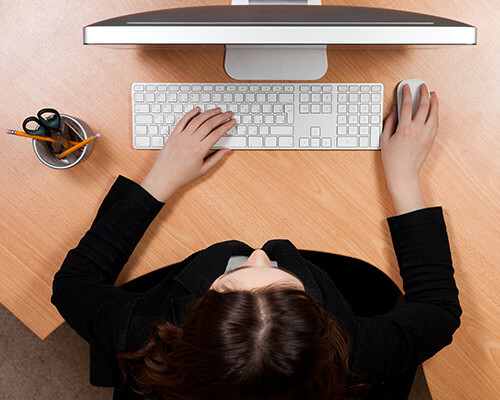 WHS professionals and workers must undertake these steps to prevent MSDs. 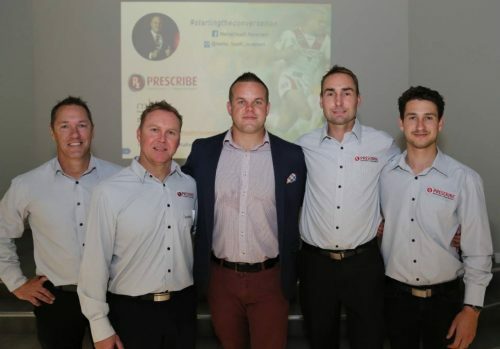 To hear about some of the innovative and effective strategies we are using in the mining industry visit our website www.prescribeaustralia.com.au or call 1300 798 771.